Dust storms so dense you can’t see your hand in front of your face; children dying of dust pneumonia; scarce water, and any that is present is contaminated with debris so badly that it has to be strained through a cloth to be drinkable. So begins Hannah Holleman’s account of how the US Dust Bowl of the 1930s, far from being a disaster so terrible that it couldn’t be allowed to happen again, is a phenomenon we are on course to repeat. Holleman sets out, in scholarly but readable terms, how the mistreatment of land and its devastating consequences was then, and still is, a symptom of an imperialist and capitalist system seeking to maximize return and taking no account of people or the ecosystem. Cash crop agriculture demands constant returns, and fields cannot be rested when there are taxes and debts to pay. 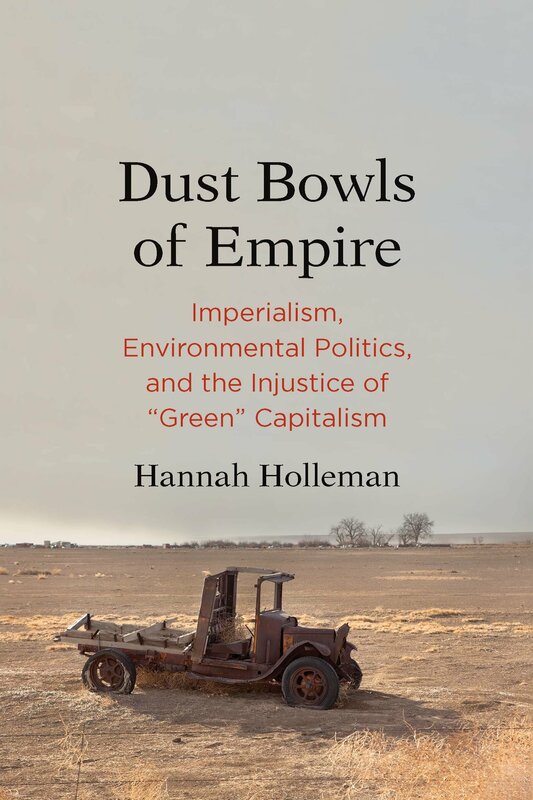 The loss of soil from over-worked land was an acknowledged problem throughout the British Empire, and to Holleman, this ‘makes clear that the Dust Bowl was one spectacular instance of a global problem of soil erosion associated with capitalist colonial expansion’. She argues that with climate change, both drought and soil erosion will be exacerbated, but, despite the warnings from history, our present political systems are nowhere near acknowledging the scale of the crisis or taking steps to tackle it. Today, 80% of the world’s agricultural land is affected by erosion classified as moderate to severe. Yet the political response, by national governments and global institutions such as the FAO, has been puny. Although no less puny than to the challenge of climate change overall, as Holleman points out. She is dismissive of ‘green capitalism’: the idea that our current system can be adapted to meet ecological and human needs, and scathing about the notion of ‘ecosystem services’ which could serve to justify the needs of any given stakeholder, including large corporations. The much vaunted US Green New Deal doesn’t cut it either. Those in the mainstream environmental movement do not effectively critique the present system as they are part of the elite and ‘they have not lived, or do not have to live, where the deeper conflict plays out’. This makes uncomfortable reading for those of us working in the field and indeed leading sheltered lives, away from ravaged ecosystems and ruined livelihoods. The broad political vision in this book is a revolution against capitalism, although Holleman offers no detailed prescription as to how this is to be achieved – it is up to us how we learn the lessons of history. I am one of those guilty (I’m sure in Holleman’s view) of thinking that the present system can be adapted to meet the needs of people and planet with the right kind of political leadership, international co-operation and redirection of capital. So far, however, the signs are not promising. In any event, reading this book will leave you in no doubt that the global soil crisis is urgent and worsening, and we ignore it at our peril. Given the lack of popular and political attention to soil, certainly compared to plastic or pollution, the book is a wake-up call that should be part of everyone’s consciousness. The UK has its own soil fertility and erosion problems, as acknowledged by Michael Gove’s launch of a Sustainable Soils Alliance in autumn 2017. As we reformulate agricultural policy in the wake of the Common Agricultural Policy, there is a rare opportunity to take a political lead on one of the most unsung but most systemic issues of our times. IES members can get 30% off this book from Yalebooks.co.uk with the code: Y1899 until the end of April. Analysis: Can fun & games help save the planet?